All too often people find themselves fastening in movements that go against their characteristics. It’s great we practice self-examination, self-questioning regularly to ensure that what we are doing matches with who we ultimately want to be. Asking questions to yourself will surely uplift your cognizance. Always ask yourself why you are doing this.? What will be the outcome of this task? Whether I am ready for the outcomes whatever it may seem. If all above question is clear to you then it will be helping you with your upcoming success and outcomes. If this is what you’ve planned for yourself to become or desire. But if not, what is stopping you? Isn’t everything we do in life is a way to get happier? But still even after trying different things you’re not happy — then there’s something holding you back which you have no clue about. Your happiness should be your ultimate goal, do not sacrifice it for short-term validation. A lot of talented people fail to keep progressing in life simply because they’re self-righteous. The scary thing is, you can be complacent and not even know it. Be aware of getting too conventional to habits and always strive to challenge yourself. Do it now. Stay motivated. 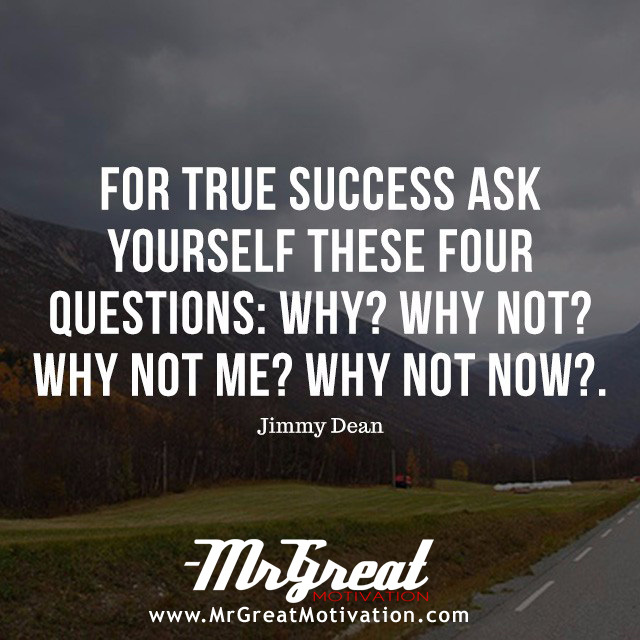 We hope guys you find Quote "For true success ask yourself these four questions: Why? Why not? Why not me? Why not now? - James Allen" by Mr Great Motivations useful. If you think we have made some efforts, then don't forgot to appreciate us by sharing this Quote with your friends and family, And thanks for visiting.